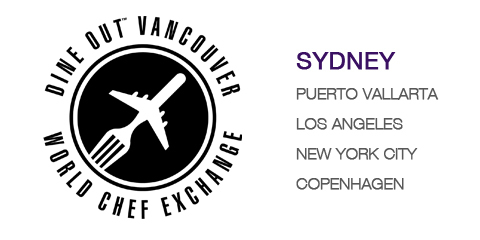 Dine Out Vancouver Festival&apos;s brand-new event, The World Chef Exchange, is already generating international buzz. The event consists of a series of five exclusive dinners starring award-winning chefs from Sydney, New York, Copenhagen, Los Angeles and Puerto Vallarta. During each one-night-only event, an international and local chef will join forces to produce a powerhouse feast in the Vancouver chef&apos;s restaurant, taking inspiration from their respective restaurants&apos; most popular dishes, their own favourite fare and seasonal ingredients. Event tickets will go on sale in December, so surf over to the Dine Out website and snap yours up - seats are limited, and these collaborations are simply too marvelous to miss. Other Dine Out event highlights include a craft-beer-and-pancakes brunch; decadent feasts inspired by culinary-minded films; a whisky- focused dinner with a nod to Robbie Burns; an elegant under-the-sea theme at the Vancouver Aquarium; and a chef&apos;s personal tribute to his mentors - expressed through a bespoke menu. Produced by Tourism Vancouver, Dine Out Vancouver Festival is Canada&apos;s largest annual celebration of food and drink. Attracting more than 100,000 locals and visitors, the festival takes over the city with 17 days of culinary events, prix fixe menus at 200-plus restaurants (at $20, $30 or $40 price points), as well as "Dine and Stay" packages and special hotel rates. The festival promotes local and regional ingredients, the wines of British Columbia, and the city&apos;s exceptional culinary talent. Dine Out Vancouver Festival 2016 runs from January 15 to 31.